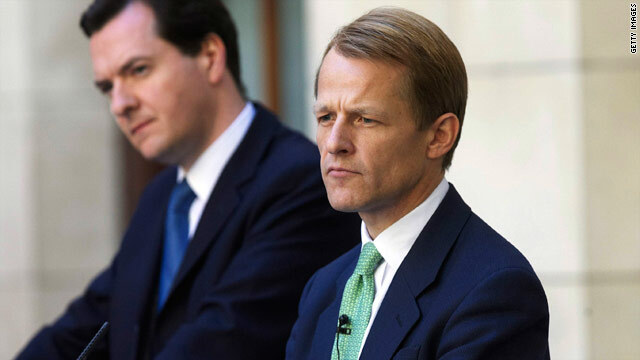 David Laws (right) and Finance Minister George Osbourne announce major budget cuts to the UK press. London, England (CNN) -- The Cabinet minister who admitted using taxpayers' money to rent rooms from his male partner has resigned over the allegations, a spokeswoman for his party confirmed Saturday. David Laws, the chief secretary to the Treasury and one of five Liberal Democrat lawmakers appointed to the Conservative-dominated Cabinet, issued a statement to the British media late Friday saying he was motivated by a desire to keep his relationship with the man private and not to reveal his own sexuality. He vowed to immediately repay the £40,000 ($57,800) the British Press Association says he claimed for rooms in two London properties owned by his partner between 2006 and 2009. The spokeswoman for the Liberal Dems told CNN Saturday that Laws stepped down from the Treasury post because he felt he couldn't responsibly perform his duties while facing an investigation into the allegations. He will continue in his role as a member of parliament for the party, she said. The Daily Telegraph, whose investigation into lawmakers' expenses last year uncovered a widespread abuse of the system, reported that Laws' controversial claims were not uncovered by the resulting inquiry into the scandal because he did not admit his landlord was also his long-standing partner, James Lundie. We made the decision to keep our relationship private and believed that was our right. Clearly that cannot now remain the case. Strict rules introduced in 2006 prevent lawmakers from renting a property from a partner. "At no point did I consider myself to be in breach of the rules which in 2009 defined partner as 'one of a couple ... who although not married to each other or civil partners are living together and treat each other as spouses,'" Laws said in his statement. "I now accept that this was open to interpretation and will immediately pay back the costs of the rent and other housing costs I claimed from the time the rules changed until August 2009. "James and I are intensely private people. We made the decision to keep our relationship private and believed that was our right. Clearly that cannot now remain the case." Laws' revelation comes days after he announced £6 billion ($8.68 billion) of cuts for the next year, warning that the country was moving from an "age of plenty to an age of austerity in the public finances." According to British press reports, the well-regarded Laws is viewed by his Conservative coalition partners as the government's economic "hatchet man." But the news will come as a blow to new Prime Minister David Cameron, who pledged to eradicate sleaze from government during his election campaign. It will also be the first major test for the fledgling coalition government. A spokesman for Cameron told the BBC: "The prime minister has been made aware of this situation and he agrees with David Laws' decision to self-refer to the Parliamentary Standards Commissioner." The Parliamentary Standards Commissioner is responsible for lawmakers' conduct.